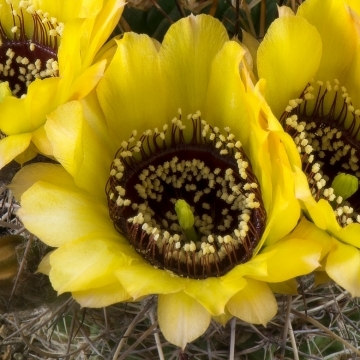 = Lobivia jajoiana var. nigrostoma (Kreuz. & Buining) Backeb. Cactaceae (Backeberg) 3: 1464. 1959 Backeb. Altitude: It grows at around 2400 to 3800 metres in altitude. Habitat and Ecology: This species grows in rocky areas in the altiplano. It is quite common where it occurs and not subject to any major threat. 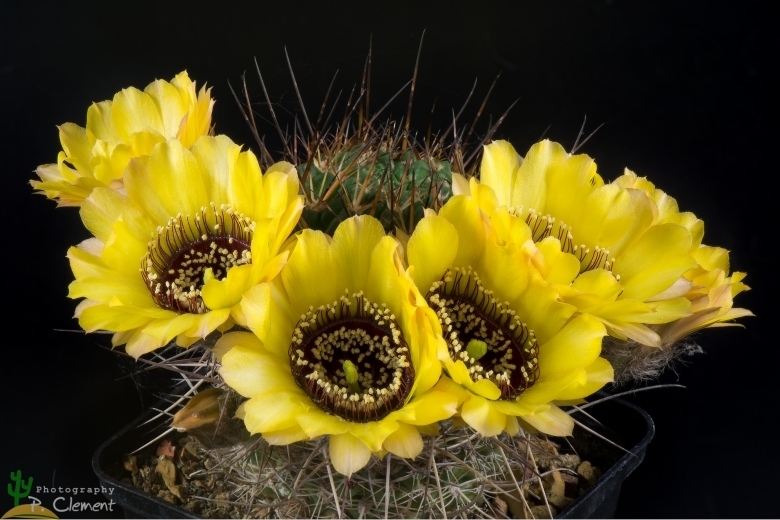 Description: Echinopsis jajoiana var. nigrostoma|SN|16040]] (Sometimes wrongly spelled “nigristoma”) is best known in cultivation as Lobivia jajoiana var. nigrostoma. Its most noticeable characteristic is the yellow flower with the hymen (or throat ring of the flower) always of a very dark purple-violet to black, thickened at the edge and glossy. Spines are not hooked, needle-like, rather long and not thick. Stems are bluish-green as in the type species. Habit: It is a small, low growing cactus that grows solitary or sometime in groups. Ribs: 10-14, compressed, running downward and divided into slanting tubercles whose arrangement creates the impression of a wavy line. Areoles: 3 mm across, with grey-white felt. Spines: Of different length, usually straight not hooked, directed upward, dark brown to blackish in youth, later grey. Central spines: 1 to 3, dark, frequently reddish; the upper spine usually attains a length of 3 cm and is usually not hooked and thickened basally (but sometime the longest of them may reach the length of 4-6 cm). Flowers: Arising from the basal tubercles on the side of the plant, up to 7 cm wide, typically pale to dark golden-yellow, (but also happening on shades of orange or red). All of them have in common that the hymen (or throat ring of the flower) is always of a very dark purple-violet to black, thickened at the edge and glossy. The stamens are purple, the anthers yellow. 4) Lowry, M. & Ortega-Baes, P. 2013. Echinopsis marsoneri. In: IUCN 2013. "IUCN Red List of Threatened Species." Version 2013.2. <www.iucnredlist.org>. Downloaded on 04 January 2014. Cultivation and Propagation: Echinopsis jajoiana var. nigrostoma|SN|16040]] (= Lobivia nigrostoma) is a summer-growing species that offers no cultivation difficulties and regularly shows its small greenish flowers if we provide an adequate winter rest period.